The Best Digital Thermometer is what you are looking for? Read this review first to find one for you. Digital thermometers are widely used in homes, fields, and industries nowadays. They’re more reliable than traditional thermometers and are easier to use as well. There are a variety of thermometers available including laser, IR, and thermocouple devices. Picking the right option can be quite a trouble if you don’t know much about them. 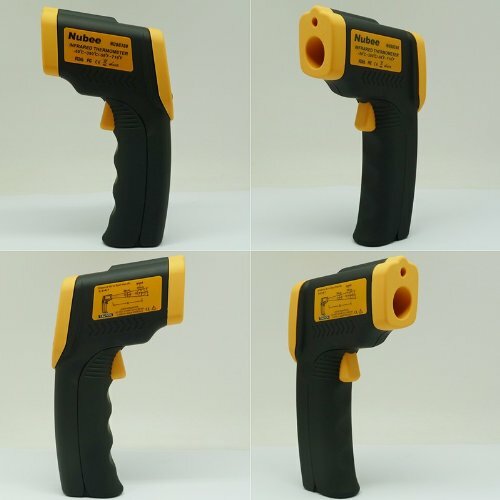 Etekcity 1022D can help to check object’s temperature could be dangerous. It works on an IR laser mechanism and doesn’t require you to make direct contact to note the temperature. Sometimes, making direct contact with objects to check temperature can be dangerous. Here’s where Etekcity 1022D can be of help. It works on an IR laser mechanism and doesn’t require you to make direct contact to note the temperature. 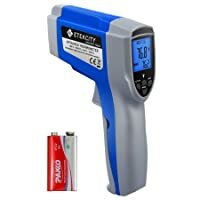 This is hands down one of the best digital thermometers because all you need to do is point the device at the object and press the trigger to read the temperature. It uses IR technology and offers a 12:1 distance to spot ratio with dual lasers. This means that you can stand at a considerable distance to note temperature with excellent accuracy. For best results, the distance should be not more than 14.7 inches. With multiple applications, Etekcity 1022D is a useful tool which can be used in home, garage and so on. It lets you choose the reading scale between Celsius and Fahrenheit. Moreover, there are some other cool features as well such as auto off, low battery indicator, and lock button. You can also set the emissivity as per your requirements. In simple words, it will let you set the mode according to the texture of the surface. The unit is suitable for a variety of uses and offers a range of 58°F~1022°F. Very quick results with a response time of 500ms. Comes with a 9v pre-installed battery that’s very durable. Doesn’t read temperature across the glass. This thermocouple thermometer works with bimetallic plastic probes. They’re suitable for different items including batteries and liquids. This thermocouple thermometer works with bimetallic plastic probes. They’re suitable for different items including batteries and liquids. However, you will have to buy exposed metal probes (Thermocouple K type) to use the unit on hot metals. The 40” long probes are convenient and safe to use. They are enclosed in a 2mm plastic and let you check temperatures without any issue. The device has 4 separate thermocouple inputs, i.e: you can use four probes at the same time. This is an excellent feature for mechanics, technicians who want to test the temperature of various machines at once. Thermocouple thermometer is a good choice for mechanics. It’s quite an advanced device and can even display max/min value, hold the value and data. Other than this, it can power off automatically if not in use for 10 minutes. This is important to save battery. You can switch between C, F, and K very easily. The LCD display will show temperature range between -328°F~2501°F and an accuracy of +-1 F.
As for type K temperature resolution, the value is <1000 °C: 0.1°C/ °F/K; >1000 °C: 1°C/°F/K. Comes with probes, carrying pouch, and 9V battery. Large LCD backlit screen that makes it easy to read the numbers. Can be used to measure melting metals as well. Not suitable to note temperature for hot metals. Results may differ when you convert from F to C to K.
The wide temperature range of this device makes it one of the best digital thermometers on the market. 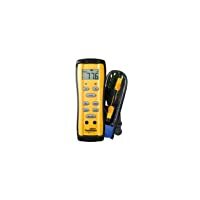 This is a dual digital thermometer that is designed to be used in the field. You can find two temperatures simultaneously along with their delta. For example, if you take two readings, T1 and T2, this thermometer will show readings for T1, T2, and T1-T2 (delta T). The unit comes with two K type thermocouples. You can choose between C or F. The device has a clear front case with a magnetic hanger to hang it on walls. It works on alkaline batteries with a life of 100 hours on average. It comes with 2.5 feet long thermocouples that let you measure temperature from a safe distance. Fieldpiece ST4 is designed to be used in field. You can use this digital thermometer to measure the temperature of different items including liquids. It has a temperature range of -58 to 2000 F.
It only takes 30 seconds to display accurate readings. Can be used to measure frozen items as well. The LED lights up if the probes are not engaged correctly. Offers temperature compensation for a fast-changing environment. Can be used in an oven. Ideal for both ambient air and surface temperature. You will need to buy a separate wet bulb to find superheat. Doesn’t have a few features such as auto-off and backlit LCD. 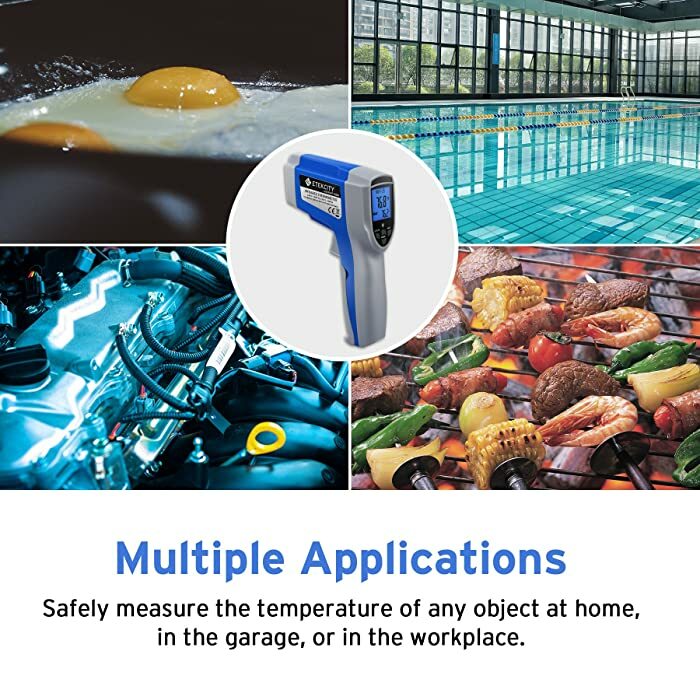 Cooper Atkins DP800W offers extended reach with its long probes to easily measure temperature in foods, grills, hot boiling liquids, etc. 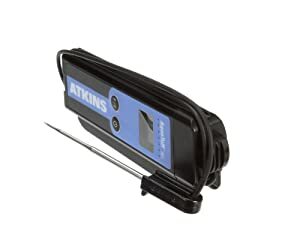 With a fast response of 6 seconds, it is one of the best digital thermometers. It works quick and offers reliable results. Thanks to a temperature range of -40 to +450 degrees F and an accuracy of +-1 F, this dual range device is ideal for a variety of uses. The probes are made up of sturdy stainless steel and are 4” long. They can read both min/max readings and shut off after 10 minutes of inactivity. 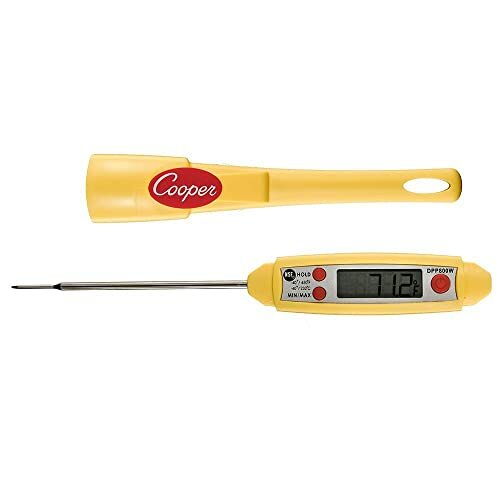 Cooper Atkins DP800W is one of the best digital thermometers out there. They are safe to immerse in liquids up to 1m as they are certified to IPX7 for protection. Therefore, expect them to run for a long period of time. The probe is anti-bacterial and the device is waterproof which is why they are one of the best digital thermometers out there. Works on a 1.5V battery that runs for 500 hours. Not suitable to use in the oven. Some settings, such as min max, can be quite complicated. 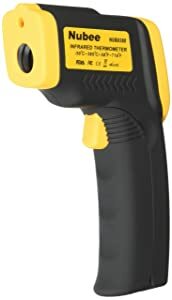 Nubee is an excellent IR thermometer meant to read temperature using a laser target pointer. It has good accuracy, fast response. Plus, it offers an excellent range as well. 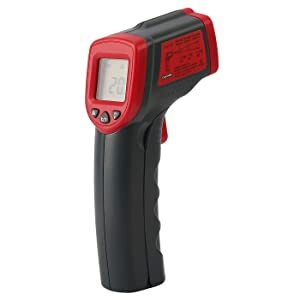 This infrared thermometer is capable of reading temperatures between -58 F to +716 F (-50 C to +380 C). It is good at noting surface temperatures but not very accurate at measuring hot liquids. Nubee helps to check the freezer and oven temperature. It might not be a medical thermometer but it can read your skin’s temperature pretty nicely. Apart from that, you can measure the temperature of various surfaces from a safe distance as it works on a laser beam IR technology. 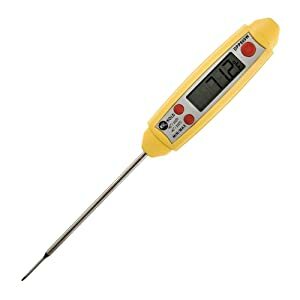 You can check your freezer and oven temperature with this thermometer as well. Precision aiming with a laser pointer. Can’t measure ambient air temperature. The versatility makes HDE become the best digital thermometer. It is quite an affordable unit and is also very easy to use. The versatility of this tool makes it the best digital thermometer. It is quite an affordable unit and is also very easy to use. This digital thermometer features a class II laser which is meant to perform accurate readings with the 1mW power output. The battery runs for a long duration as the device turns off automatically when not in use. Moreover, it also comes with a battery indicator to let you know when the battery gets low. With HDE, users can check the car battery temperature easily. It covers both Celsius and Fahrenheit measurements with temperature ranges of 26 to +716 F / -32 to +380 C and an accuracy of +- 2 degrees. The thermometer works on a 12:1 distance ratio, meaning that the device is safe to use from a distance. Suitable to measure water temperature. Doesn’t come with AAA batteries (2 required). 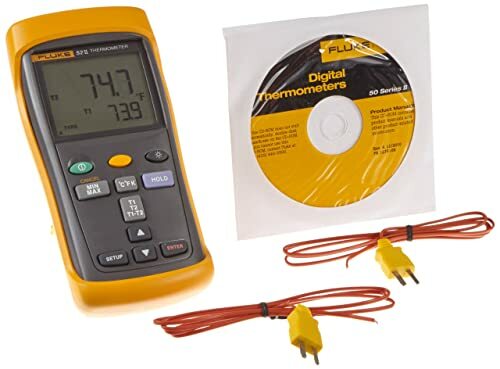 If you’re looking for a dual input digital thermometer that can show a combination of temperatures such as Delta T, -j, -k then this one can be the right pick. You can select any temperature scale of your choosing from Celsius, Kelvin, or Fahrenheit. 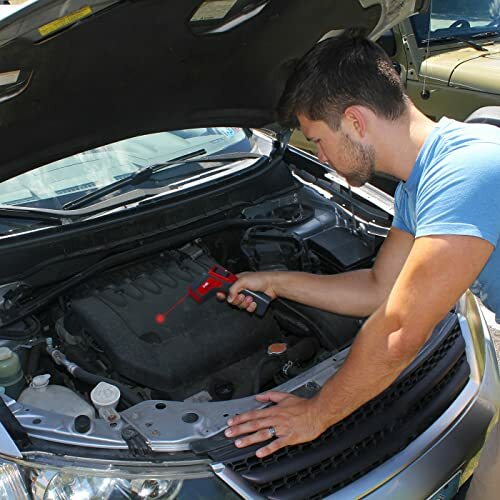 The tool is meant to deliver accurate readings thanks to the beads probe it comes with. It incorporates min, max, and average functionalities to help you find your desired temperature quickly. 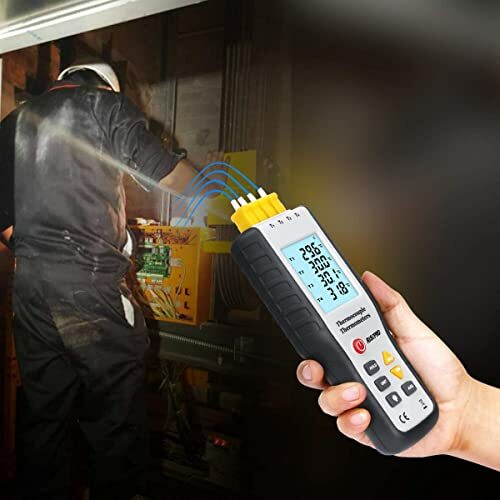 Fluke 52-2 is used in applications requiring a broad range of temperatures, including furnaces, kilns, freezers, and other industrial applications. The device has a sleep mode feature which helps save battery. It goes to sleep after a few minutes of inactivity. The large backlit LCD display is easy to read and shows quick results. Supports Kelvin, Celsius, and Fahrenheit measurements. Holds data with the press of a button. The LED screen is excellent and makes it easy to read the text. Some users may not like the design. If you’re looking for an accurate digital thermometer then this one fits the bill. It works flawlessly for foods, liquids, fields, HVAC systems, etc. 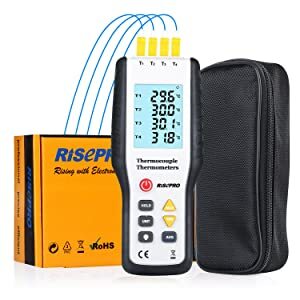 This is one of the best digital thermometers as it has an accuracy of +-9 degrees F. Moreover, it doesn’t require recalibration which is a breeze. It comes with a duraNeedle probe which is known for durability and excellent accuracy. The probe wire is of high quality and wraps around the device with no trouble. This thermometer is IPX7 waterproof rated, therefore, expect it to run for a long time. This is one of the best digital thermometers. It incorporates a large LCD display and is able to shut itself down when inactive to save battery power. With a temperature range of -100 to 500 degrees F, this digital thermometer can test various substances that fall into this range. 1800 hours of battery life. This qualifies for the best digital thermometer as it covers a broad range of uses such as freezers, industrial applications, kilns, furnaces, etc. 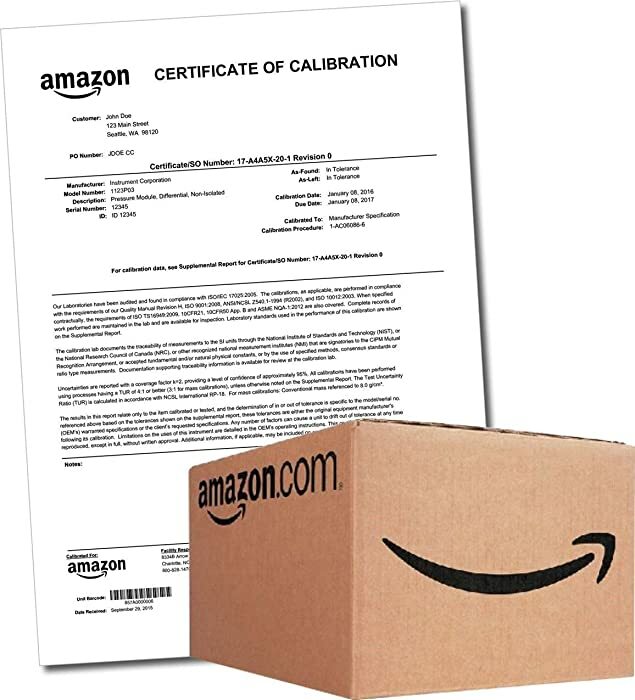 The device comes pre-calibrated and with a certificate of calibration as well. It comes with a type K bead thermocouple probe and attached to it is a 40” long durable cable. The unit offers min, max, and average temperature measurements. Its wide range of -418 to +2501 F makes it one of the strongest tools out there. You can measure the temperature in K, C or F but you’ll need a Type J, Type T, Type K, or Type E thermocouple probe. It comes equipped with a battery that has a lifespan of 1000 hours. Moreover, the device is dust and splash resistant as well. Sleep mode helps save battery. Electronic offset feature lets you compensate for thermocouple errors. Comes with NIST traceable calibration certificate. No magnetic hanger strap included. You may have to buy additional probes. These are 9 of the best digital thermometers you can get. It is important that you pick one that works well for you and is easy to use.